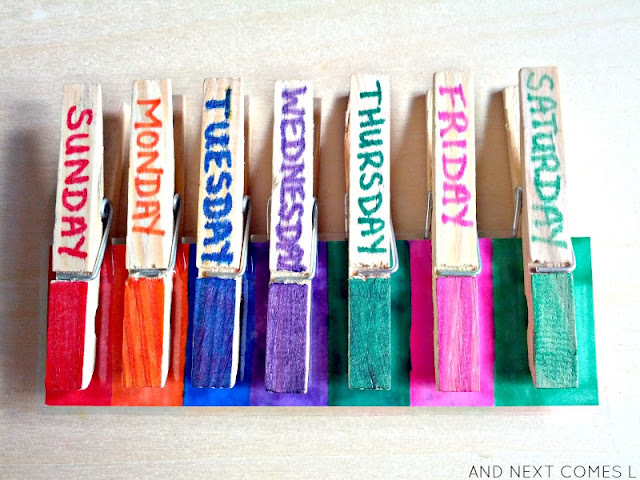 Here's a simple fine motor busy bag idea for learning the days of the week. It also encourages color matching, which means that this busy bag is also self-correcting. 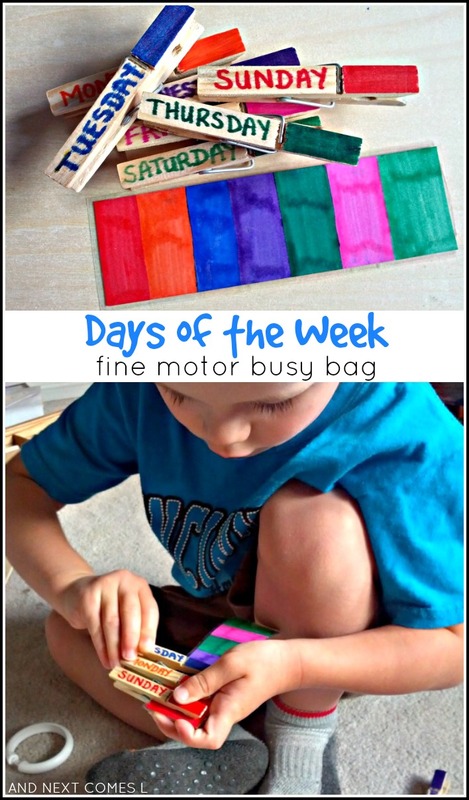 I decided to make this days of the week busy bag for my preschooler. 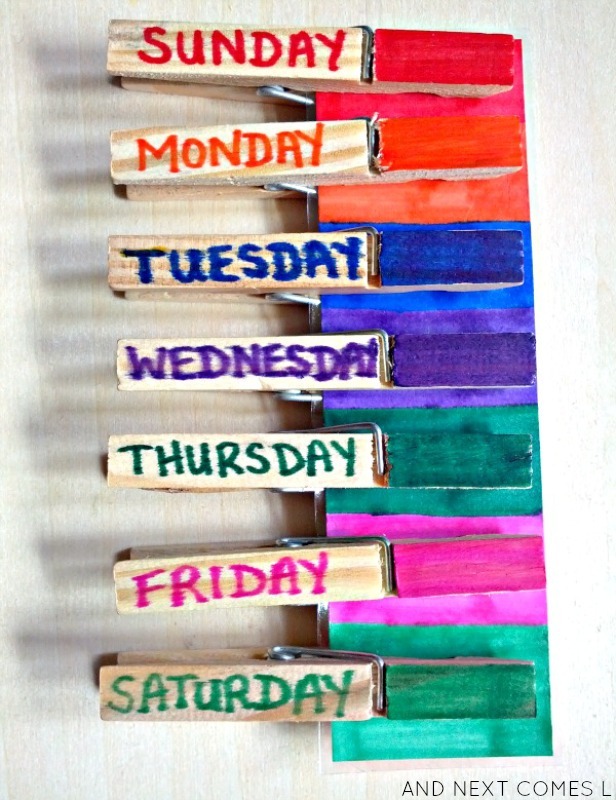 I know that J can read some of the days’ names like Friday and Sunday, but I’m not really sure he knows that the days go in a particular order. He’s not even four yet, so I am sure he doesn’t really care that they go in a specific order. Regardless, I’d like him to at least be familiar with the names of all the days of the week and I’m hoping that this busy bag will help him achieve that. If not, at least he’ll get some good color matching and fine motor practice in. Or, if he’s not interested in it, then at least K will keep busy by pulling all the clothespins apart, which he has already done multiple times. To make the busy bag, I wrote each day of the week in a different colored permanent marker onto a wooden clothespin. 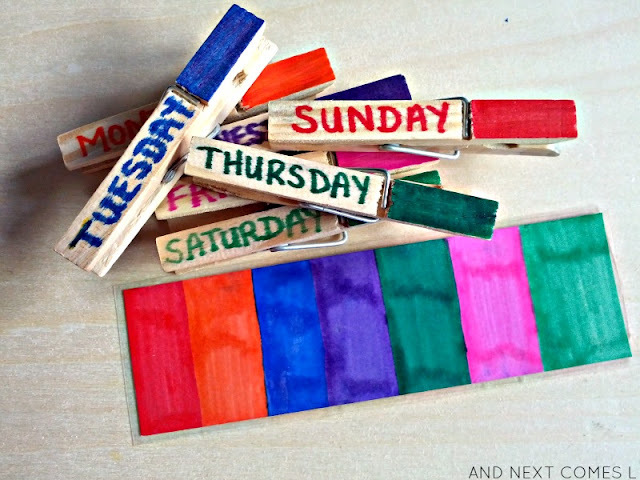 I then colored the end of the clothespin in the same color. Next, I cut a piece of cardstock and colored it using the colors of each clothespin as a guide, starting with Sunday’s color, then Monday’s color, etc. I then covered the cardstock in contact paper. Laminating it would work too. Then it's ready for playing with! Or arranged more like they would appear on the calendar. In hindsight, I think a circle for the matching part of this activity would have been better than a strip, but I only had enough contact paper on hand to do the small rectangular strip. 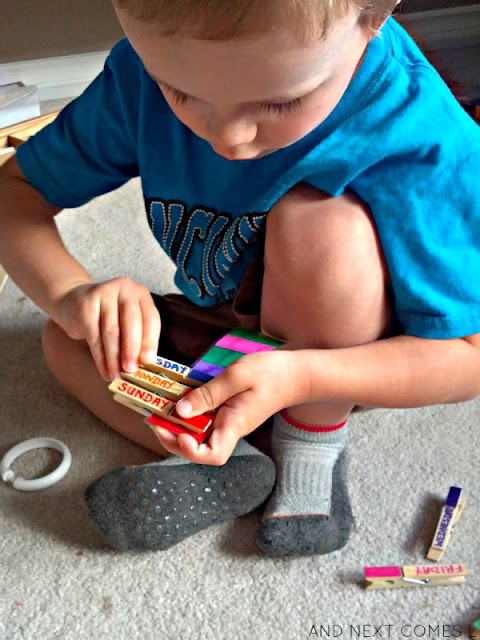 Regardless, J was eager to try out this busy bag activity and quickly showed that he could do it. This post originally appeared on B-Inspired Mama. You can read the original post here.